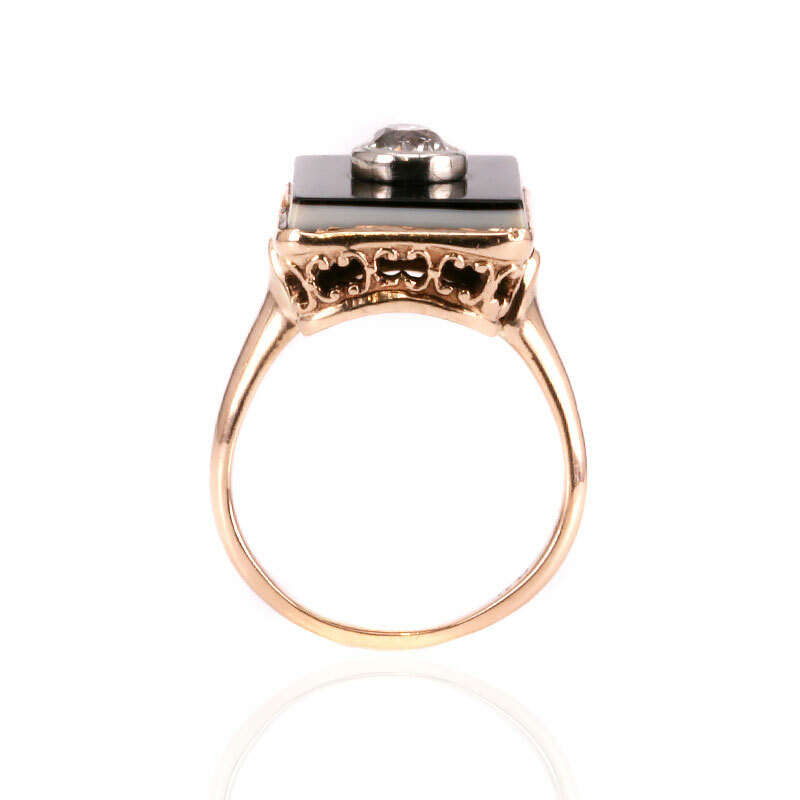 Product code: ES8307 Categories: Art Deco, Art Deco Rings & Art Deco Engagement Rings. Here is such a fabulous 18 carat rose gold onyx and diamond ring dating from the 1920’s that looks so beautiful from every angle that you look at it. From the top is the onyx which is set with a 0.42 carat European cut diamond in the centre which has such a wonderful sparkle to it and certainly stands out set against the black colour of the onyx. This top section of the ring measures 16.9mm by 12.7mm and regardless of which finger it is worn on, it will certainly get the attention that it rightly deserves. Looking at the ring from the side shows the beautiful warm colour emanating from the rose gold. It is hard to find rose gold in 18 carat as the higher in carat the gold, the more yellow it becomes, and the colour of this rose is so lovely and soft and looks even more beautiful on the finger. Also from the side you can see the most elegant setting which shows how much attention to detail went into making this ring all those years ago and showcases the high quality of this ring. And finally it also shows the natural white band in the onyx. Onyx is a cryptocrystalline material from the quartz family and is more often seen in just black, however onyx has a white band naturally occurring which can be seen from the side. 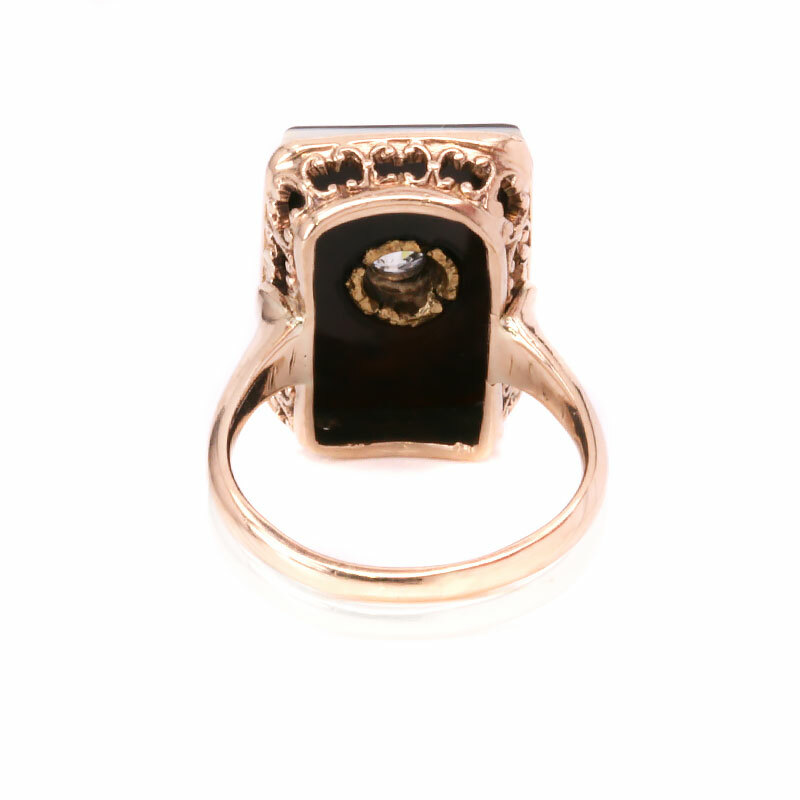 All of this goes to create a truly stunning example of an Art Deco onyx and diamond ring that highlights why there is nothing quite like a genuine Art Deco ring adorning your finger. Tags: Art Deco diamodn ring, Art Deco onyx and diamond ring. Art Deco rings of the 1920’s have always remained so popular throughout the decades. With wonderful geometric designs that look as beautiful today as when they were made, Art Deco engagement rings are without a doubt the most sought after of all the eras for this special occasion.